Below are course descriptions for the regularly scheduled matches we host at Iron Sights Shooting Range in Oceanside. While the course of fire and scoring generally adhere closely to what is described here the Match Director may modify the course of fire, rules, and/or scoring in the interests of safety, competition, and time constraints. Sometimes they change things up for no good reason at all. The Match Director always has the final say. More information can also be found on our Frequently Asked Questions page. Visit the gallery for videos and pictures from recent matches. Think you have a few good ideas for a match or do you just want to give us a hand? We'd love to hear from you. The USPSA match is on the fourth Thursday of the month. We generally shoot 3 or 4 stages plus a classifier, with a round count between 75 and 125. USPSA rules apply, expect lots of targets, shooting on the move, and lots of flexibility in how you "solve" the problem. We've had stages with minimum round counts as high as 30, so bring at least 4 magazines and plenty of ammo. Shooting starts a little after 6:00PM, and the match typically runs to 9:00PM or 9:30PM (but can run as late as 10:00PM). Current match fee is $17, which includes the fee for submitting classifier scores to USPSA. Standard USPSA/IPSC paper targets are used, with each target worth 5, 10, or 15 points - depending upon how many shots are required per target. Unlike IDPA partially loaded magazines do not have to be retained during a reload and use of cover is not required. Courses of fire are usually minimally scripted, with the shooter left to "solve the problem" as he or she sees fit. IDPA Matches are held on the last Sunday of every month. We take over the entire Iron Sights range and set up four stages (two on the rifle side and two on the pistol side). In addition to an IDPA legal handgun you will need a holster, 3 magazines, 2 magazine pouches, a cover garment, and approximately 100 rounds of ammunition. If you're a little short on equipment someone at the match can generally help you out. Ammunition may be purchased at the range. Doors for the match open at 7:00AM, mandatory shooters meeting starts at 7:15AM, and we begin shooting at 7:30AM sharp. The match generally lasts until 10:00AM or a little after, at which time the range opens to the general public. Current match fee is $17. You can learn more about the IDPA at www.idpa.com. Courses of fire and rules follow IDPA guidelines. The club is fortunate to have 6 IDPA-certified Range Safety Offices available to run the stages. The Frequently Asked Questions page also has an IDPA Match section. Fun Steel is held on the first and third Thursday of the month. The match generally consists of 3 stages with 3 strings per stage or 4 stages with 2 strings per stage. Each string has six targets, no make-up shots are allowed. Strings are shot from the draw, although new shooters and shooters without a holster may elect to shoot from the low ready position. This is a great match for new competitive shooters! Sign up begins around 6:30PM, shooting starts at 7:00PM, and the match typically runs to 9:00PM or 9:30PM (but can run as late as 10:00PM). Current match fee is $14, for $2 more you can shoot a second gun (space permitting). Scoring is based on total time, with a time penalty of 5 seconds added for each miss. In the current 3 stage/3 string course of fire the shooter shoots the same course of fire three times per stage, the worst time is thrown out and the remaining two times are added to get the score for the stage. The Frequently Asked Questions page also has a Steel Match section. Man versus Man is probably our most popular Thursday night match and is held on the second Thursday of the month. 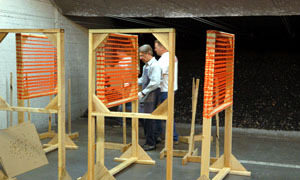 We setup two identical (mirror image) courses of fire that include a mixture of paper and steel targets. Both shooters race to complete their course of fire and be the first to drop the stop plate. The match will test your ability to use cover, shoot on the move, manage your ammunition, and perform under pressure. We usually shoot four stages, after the first stage shooters are paired by ability. Pairing shooters by ability creates a handicapping system that means just about anyone can win. The course of fire is changed between stages. Sign up begins around 6:30PM, shooting starts at 7:00PM, and the match typically runs to 9:00PM or 9:30PM (but can run as late as 10:00PM). Current match fee is $14. Shooters begin each stage at the high cover at the left or right wall with a total of six rounds in their gun and the gun in their holster. On the whistle both shooters draw and engage targets. Magazine changes must be done behind cover. Shooters not behind cover may shoot on the move, but may not stop. At least one round must be fired from high cover (start position), and the stop plate must be shot at from a knee at the the low cover in the center of the room. Each of the paper targets is worth 10 points (best two hits are scored using IDPA rules/scoring zones), and all 4 four steel targets must be dropped for an additional 10 points. First shooter to drop their stop plate gets an additional 5 points, making each stage typically worth between 55 and 85 points maximum, depending upon the number of paper targets. Once in a blue moon the month will have five Thursdays, when it does we shoot a mystery match on that fifth Thursday. Just about anything goes, typically that includes shooting on the move, multiple magazines, paper targets, steel targets, etc. Most of the time this match ends up looking a lot like the mini-IPSC match. Sign up begins around 6:30PM, shooting starts at 7:00PM, and the match typically runs to 9:00PM or 9:30PM (but can run as late as 10:00PM). Current match fee is $14.